This is my first piece for National Geographic. It's about why we should be washing our hair with shampoo bars instead of wasting plastic shampoo bottles, which contribute to the overwhelming plastic waste problem in the world and pollute oceans and harm marine life. It was published in August 2018. I interviewed Benjamin Novak Hudgins for ​Texas Lifestyle magazine. This piece was published online in April 2018. Benjamin Novak Hudgins recently opened up a salon in Fort Worth, Texas that is 95 percent sustainable -- a rare feat in the salon world. I talked with him about his new shop, the hazardous side effects of the beauty industry and how we can all try to make the world a little better when it comes to beauty. This story for OZY magazine was published online in November 2017. It tells about Kat Mendenhall, the only known purveyor of vegan leather custom-made cowboy boots in Texas. Texans love their cowboy boots, and Mendenhall is creating a way to fill the need for cowboy boots without harming animals along the way. This blog for Virtuoso was published online in October 2017, and gives consumers multiple alternatives to plastic straws, as Americans alone use 500 million plastic straws each day, most of which end up in our oceans. 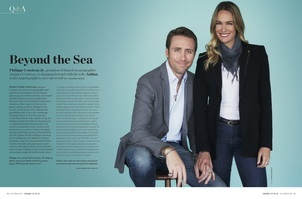 This is a Q&A I did with Philippe Cousteau Jr., grandson to Jacques Cousteau, and his wife Ashlan about their efforts to continue the Cousteau legacy of conservation and make our planet a better place. This is from the October 2016 issue of American Way. ​To read the full issue, click here.